The Genesis Shelter provides shelter for babies six months of age and younger and their families, empowering them to grow and develop in nurturing and healthy surroundings. On Sept 20, 2012 we visited the shelter delivering towels, comforters, sheets, and other baby items, as well as sponsoring dinner for the families. 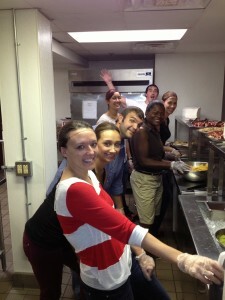 Together, we cooked food and served the meals to the families. We also had an opportunity to mingle with the women and children, and hold their babies during and after dinner. Knowing that GlobalCHF contributions to Genesis Shelter will makes this a positive difference in the families lives is a rewarding experience to our team. The Global Children’s Humanitarian Foundation strives to provide opportunities that improve the lives of individuals in our communities including our customers and staff. Through financial contributions, in-kind donations and volunteerism, the Global Children’s Humanitarian Foundation supports initiatives focused on enhancing opportunities.